To recognize Diabetes Awareness Month in November, HIPHI Healthy Living Active Living (HEAL) Hawai’i Island and ChoiceMART at Kealakekua Ranch Center invited Chef Stephen to share his expertise, experience with plant-based eating, and his story about reducing risk for type 2 diabetes with the community on Saturday, November 5. Chef Stephen Rouelle spent over three decades as an award-winning gourmet chef, most recently serving as Executive Chef at the Fairmont Orchid. Four years ago, he decided to make a change in his diet and lifestyle for the sake of his health. He transitioned to a vegetarian, then vegan, then raw vegan diet, losing over 150 lbs in the process. Recognizing the need for a restaurant with organic and locally sourced food, he left the Fairmont with associate Abraham Go to open Under the Bodhi Tree (located in the Shops at Mauna Lani, South Kohala, HI). He focuses on creating vibrant, beautifully composed dishes that will satisfy vegetarians, vegans, meat-eaters and everyone in-between. November’s event offered the community an opportunity to learn, taste, and discover how vegetarian, vegan and raw foods can be healthful, delicious, and easy to make. 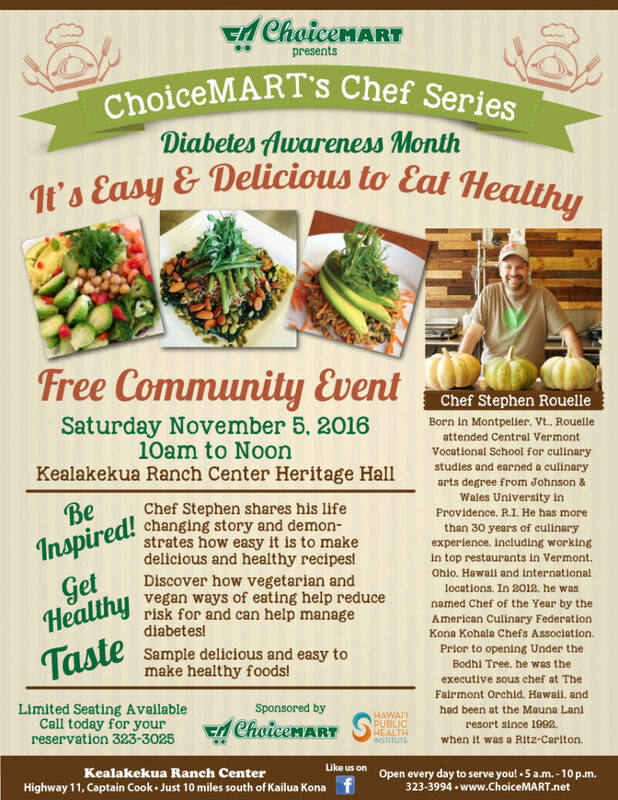 In the Kealakekua Ranch Center’s Heritage Hall, Chef Stephen demonstrated and shared recipes for Kabocha Pumpkin Apple Curry Soup, Thai Avocado Zucchini Noodles, and treated us with a sampling of his Under the Bodhi Tree Chocolate Banana Oat Bars. Thirty-four people from the West Hawai‘i area participated and rated the program as excellent! Comments from those attending praised the learning and tasting from Chef Stephen. See the Program Evaluation here.